"A new Create PDF feature is available in Microsoft Dynamics NAV 2009"
When you're dealing with about 300+ KB articles, that all says "overflow this", "insufficient that", "cannot do this", "system does not do that" .. then something like "a new.." really stands out. As Microsoft describes it: This feature enables the report to be printed as a Portable Document Format (PDF) document on the Microsoft Dynamics NAV server and then to be downloaded to the RoleTailored client (RTC) (so now you know how it works in the background :)). 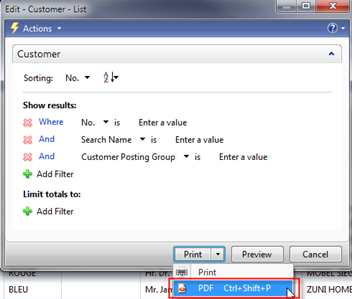 If the Adobe Acrobat is loaded previously, the PDF document can be rendered. Therefore, you can save the document or print the document to a desired printer. I really do like this feature, because I find it a better "preview" option for documents.